Wouldn’t you want to know how well people convert on your site? Setting up basic conversion goals will enable you to measure site engagement – based on time on site, destination page or particular events – and what drives that. Below I’ll cover the reasons why you should set up goal tracking in your Google Analytics, different types of goals available, goal value, and then explain how to set them up. So why should you track goals? Goals are great for tracking important actions that are crucial for your business and understanding how people convert on your site. 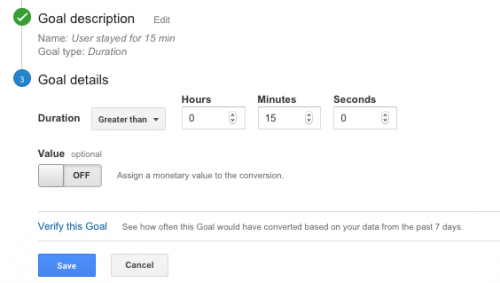 Once you set up goals, you will be able to analyse conversion rates in the Goals reports. 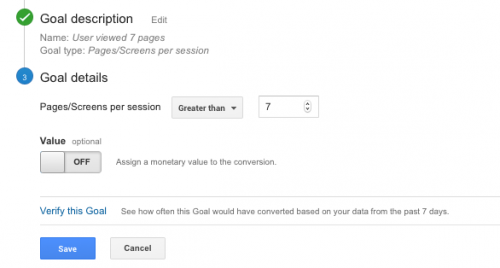 Conversion data will also appear in other Google Analytics reports, like the Attribution and Acquisition reports. 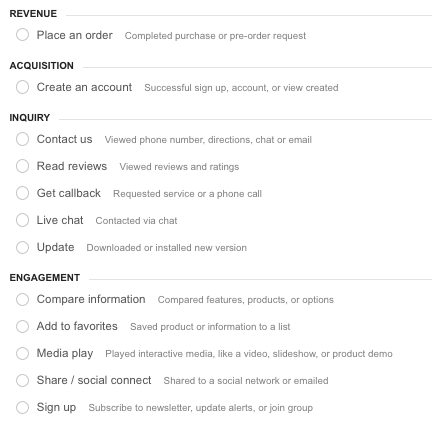 This will help you identify which marketing campaigns and channels get users to complete the goals you have previously defined. The destination goal also allows you to set up a funnel to visualise the path people take through your site towards completing a purchase, signing up or another conversion. Seeing how people navigate through your site in a visual way makes it easier to identify where they drop off. If you see a lot of exits on particular pages, then review those pages to see if you can improve them to minimise the exits and guide more people towards converting. If you see a lot of people skipping certain pages, then your path to conversion might be too long or contain unnecessary steps. 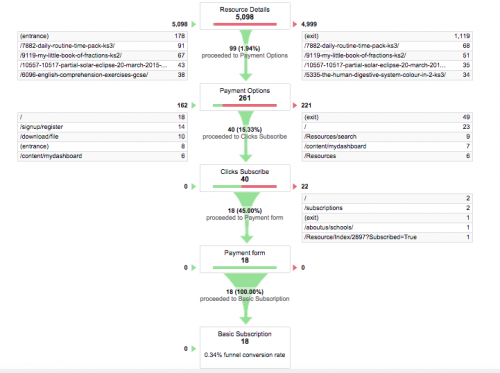 For more info on flow visualisation reports, check Google’s help pages. What kind of goals can you set up? You can set up a destination goal to track how many users reached a certain page, eg thank you, purchase confirmation or pre-order request pages. Then there’s a duration goal that tracks how many users stayed for a specific amount of time, eg for at least 15 minutes. You can also set up a pages/screens per session goal to see how many users view a specific number of pages during a session. An event goal is for when a user triggered certain events on the site that you have already set up, eg clicked on an ad, submitted a form or saved a product. What else should you know about goals? You can set up only 20 goals per view. If you need more, you can either create another view or repurpose existing goals. Goals apply to the data after you’ve created them. Goals can’t be deleted; but you can turn them off if you don’t need them. Use names that make sense so that anyone using your Google Analytics data can understand what the goals are for. Keep track of when you changed the goal by adding annotations to your reports. Do you need the goal value? Setting up a goal value is optional. You should set a monetary value for your goal when you want to track how much you earned from converting users and you’re able to calculate the worth of each lead. If you know that 5% of people who sign up on your site end up buying your service, and the average value of your service is £1000, then you can set £50 as your goal value (5% of 1000). When setting up a goal value, make sure the currency corresponds to what you use on the site or are familiar with. You can do this in Admin > View > View Settings. Are you an ecommerce site? If you’re an online retailer, then instead of using goal values you should be using Ecommerce or Enhanced Ecommerce tracking for Google Analytics. These reports will be much more insightful for tracking your store performance. So how do you set up goals? You need to set these up at the view level. Go to Admin > View > Goals, and click New Goal. Google has added some goal templates that you can choose from if you’re happy to use their naming. Alternatively, select ‘Custom’ at the end of the list and click ‘Continue’ to the goal description. 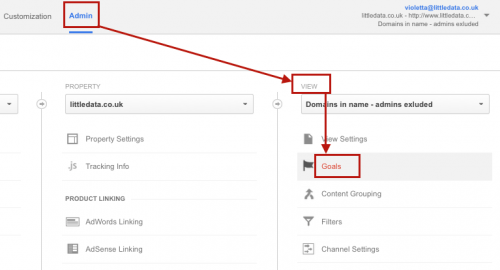 For your goal name use something that is easily understood by others using your Google Analytics account, and the goal details will depend on the type of goal you’re setting up. You can follow the blog I’ve previously written on setting up the destination goal and funnel. Click ‘Continue’ and specify the minimum amount of time you want to track. 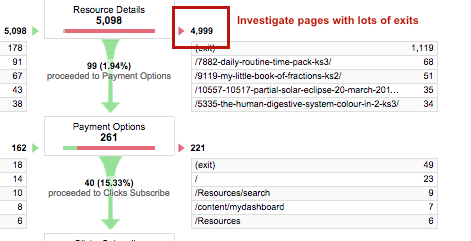 Here you specify the number of pages someone viewed per session. 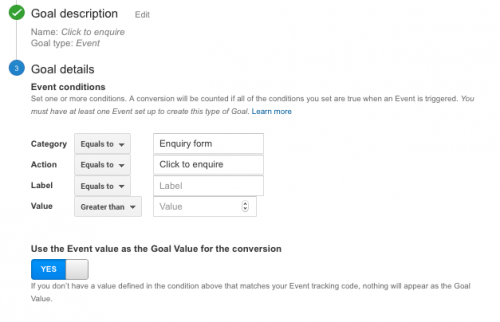 Set the event you want to track as a goal by using exactly the same category, action, label and value as in the event. If you want to use a goal value here, you have the option to use the event value you’ve already set. Verify your goal – click ‘Verify’ to check if it works. If the goal has been set up correctly, you should see an estimation of the conversion rate your goal would get. If you’re not getting anything, check each step carefully and Google’s help pages on why your conversion tracking might not be working. Once you’re happy with the setup, click ‘Create goal’ and check the results in your analytics reports after a few days or weeks, depending on the amount of traffic you get. If you need help with the setup above or have another way of using goals, I’d love to hear about it in the comments below.